One Stop Application Centre for UK, Australia, New Zealand, US, Canada, Ireland and Switzerland Unis, Unis, Foundation and Colleges. Trusted Education Consultant with more than 10 years of experience. We understand your aspirations to get to the best university possible and suggest viable alternative pathways for you. We arrange for you to meet face-to-face with Uni Representative when they come to Singapore. Most of all, our services are free and you benefit more with us working alongside with you than applying on your own! Register Your Interest NOW ! 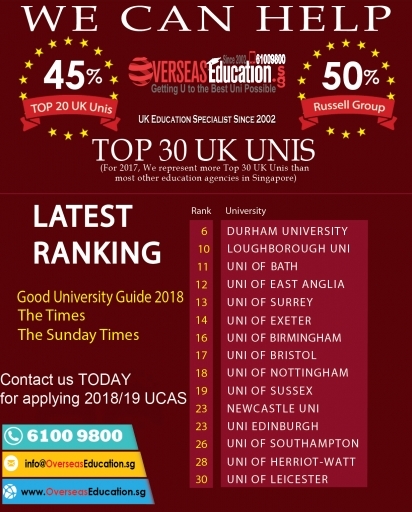 There are more than 1,000 students following a range of undergraduate and postgraduate courses overseas through OverseasEducation.sg since 2002. ©2018 OverseasEducation.sg. All rights reserved.